OldestSmacks ordered a pizza for Husband and I when he got one for himself about an hour ago. He also got a giant chocolate chip brownie (smart boy... he knows what week it is!) He earned the money (and new fancy sneakers for school) by working for my dad and stepmom last week, chopping wood for their stove, doing yard work - including hauling 75 bags of mulch from the truck to the back yard AND spreading it, and whatever else they needed help with. He’s saving the rest to buy himself a new PS3 controller since the old one broke months ago. He’s had more than his fair share of troubles over the last couple of years, but I think (I hope... *fingers crossed* *knock on wood*) that he’s doing a lot better these days, and I am hoping that this trend continues! He’s such a sweet, big-hearted kid. 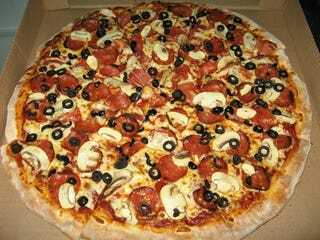 ETA: not my picture, but this is the pizza I picked. Pepperoni, mushroom, and black olive. Yum!